Although 2018's National Preparedness month is still more than 2 weeks away, it is worth remembering that by the end of August last year the residents of Houston and coastal Texas had been in recovery mode following devastating Hurricane Harvey for more than a week. And Florida was less than a week away from its own tropical nightmare (see A Post Irma Update). The point being that while September is set aside each year as a month for disaster preparation, hurricanes and other disasters don't abide by the calendar. Which is why, each May - going into the tropical season - we spend a good deal of time talking about hurricane preparedness. After an active early start, the tropics have gone relatively quiet the past six weeks, due to unfavorable winds, cooler than normal water temperatures, and an abundance of Saharan dust (SAL) in the atmosphere choking development in the Atlantic basin. 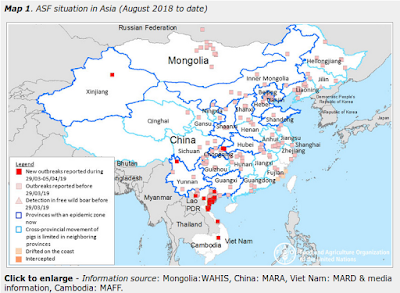 These conditions are not guaranteed to last, however, and most years we don't start seeing a big uptick in tropical activity until near the end of August (see chart below) and the peak doesn't come until mid-September. August has produced some of the most famous hurricanes in history, including Harvey (2017), Katrina (2005), Charley (2004), Andrew (1992), and Camille in 1969. Notorious Hurricane Donna (1960), formed in August but wasn't upgraded to a hurricane until Sept 1st. 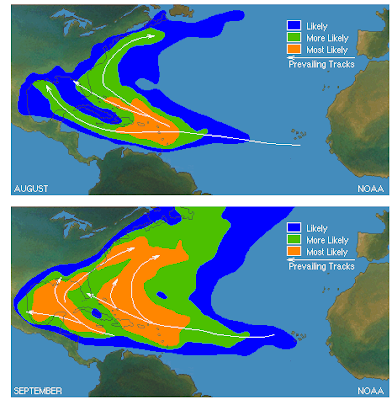 As the ocean temperatures rise late in summer, and winds aloft become more favorable, hurricanes tend to form farther to the east, giving them more time grow before encountering land (see below). 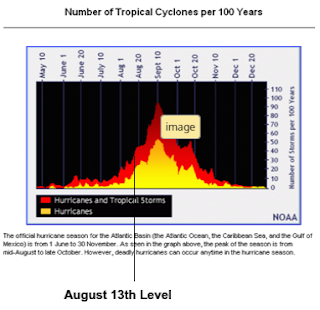 You can find much more on Hurricane Climatology at NOAA’s Tropical Cyclone Climatology page. Hopefully, after last year's horrendous season, we'll get lucky this year. But even if you don't live in Hurricane country, you probably live in Tornado, Flood, Wildfire, or Earthquake country. There is literally nowhere in the nation where a natural disaster can't touch you. 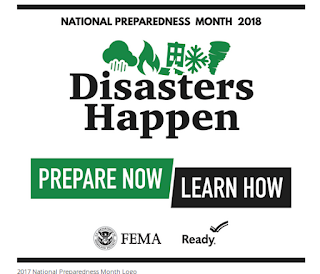 So, while I strongly urge you to participate in September's National Preparedness month, there's a lot to be said for getting an early jump on things. You need to ask yourself . . . if a disaster struck my community today, do I already have? A way to provide light when the grid is down. A way to stay cool (fans) or warm when the power is out. An emergency plan, including meeting places, emergency out-of-state contact numbers, a disaster buddy, and in case you must evacuate, a bug-out bag and a predetermined place to go. If your answer is `no’, you have some work to do. A good place to get started is by visiting Ready.gov. Despite being pretty well prepared going into last year's hurricane season, I found some areas of my preps that could be improved upon (see Little Preps Mean A Lot and Rethinking Solar Power On A Budget),something I worked on over the winter.